Note: This post also contains my first ever discount code! Hooray! It’s for the one item that I had in my diaper bag that turned out to be shockingly useful, so I want other people to get it too. You can scroll to the bottom for it, but I hopefully have other relevant information shared here as well. Last week when I rushed out the door to the ER with my baby, I grabbed the diaper bag that I had taken with me earlier in the day to the pediatrician’s office for a quick well-child visit. You would think that in the span of a few hours it would still be intact, which is what I clearly assumed as I blindly threw it over my shoulder and took my pants-less baby to the hospital. When I arrived at the security line and was asked for my ID, that’s when I realized I was very wrong. In the middle of the emergency no one cared that I wasn’t prepared, but as we settled in to our seven hour observation period, it really sucked to realize that I didn’t have the basic essentials needed for the trip. I’ve come to realize that I have to treat a diaper bag like a “Go Bag” and keep it untouched in case of an emergency. This resolution is easier said than done. My toddler likes to empty bags and wallets, and as I realized after the fact, some of what he has disappeared seems to be totally gone and needs replacing. My husband likes to raid my diaper bag for diapers and wipes if he’s watching a particularly intense game of whatever sport is in season and doesn’t want to walk to the boys’ room to get supplies. I have a bad habit of switching bags and leaving a trail behind me, which is how I found a Presidential Inauguration ticket from three years ago in a non-diaper bag/purse I pulled out of a closet last week. Diapers and wipes. This is so obvious, yet I had three wipes and no diapers when I got to the hospital. A changing pad is helpful, but not totally essential and very likely to be grabbed if it’s sticking out. All purpose hand wipes like Wet Ones, or my favorite, Cleanwell, which are antibacterial wipes that don’t contain Triclosan or alcohol. This would have been good when my baby started licking the IV pole that his monitors were on. I could have at least given it a little cleaning swipe before he completed his tongue bath of the hospital equipment. Clothes for the baby/kids: A change of seasonally appropriate clothing, an extra outer layer and a pair of socks. Alternately, a one piece PJ set and a swaddling-type blanket would also work and take up less space. Seriously, my baby was in a mesh tank top onesie which was perfect when it was 80 outside and less awesome when we were stuck in air conditioning for seven hours. Copies of relevant documents/IDs. I didn’t have my license or my baby’s insurance card on me. Fortunately we had been to the lab at the hospital for blood work, but if we hadn’t I fear the bill we would have had to pay to get discharged. Toys, books, or other items for basic entertainment. The hospital provided some toys and books for us which was really sweet, but at the same time, GERMS! Snacks for everybody. I didn’t know we would have to be there so long. The hospital gave me some goldfish crackers, but I wasn’t going to eat them over the head of my milk-allergic baby who would have just freaked out about me not sharing. I’m sure there are other things that would be good in the bag that don’t apply to us. If I was formula or combo-feeding my baby, a ready-to-drink formula or pre-measured powder and a bottle would also make sense. I wish I had grabbed a bottle of pumped milk on my way out, as I was so anxious that I had a hard time getting let down to nurse. I mentioned it in another post, but for as unprepared as I was, I did have one dark horse of an awesome item with me – my water bottle. 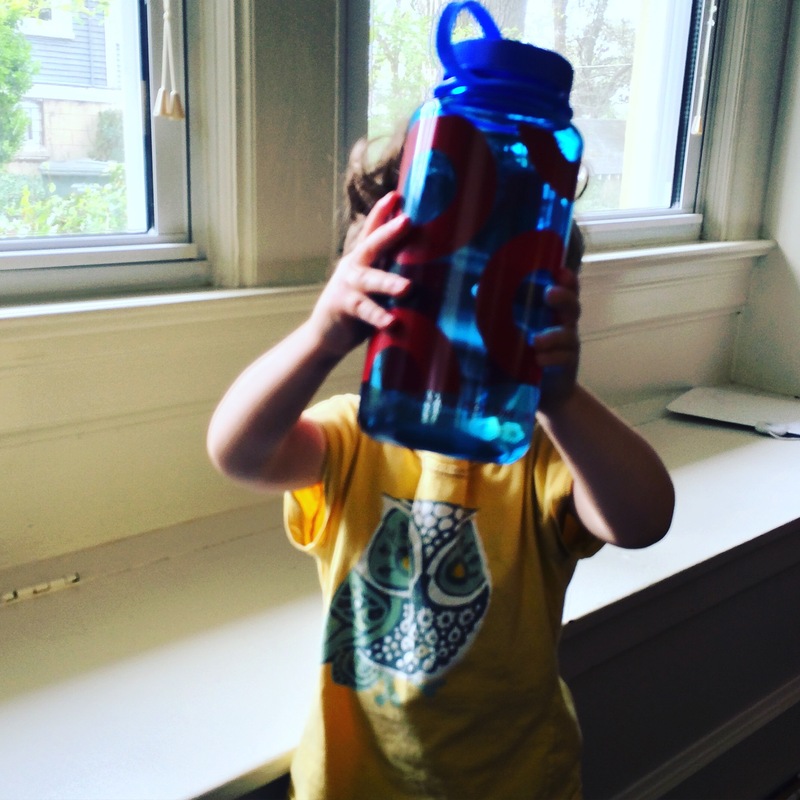 Yes, this unassuming Nalgene bottle not only had a little water in it which was convenient, but my baby loved it. The hospital gave us this light up musical toy which he liked until I pulled out my bottle. He went bananas and played with it on and off for hours. Yes, seriously, HOURS. 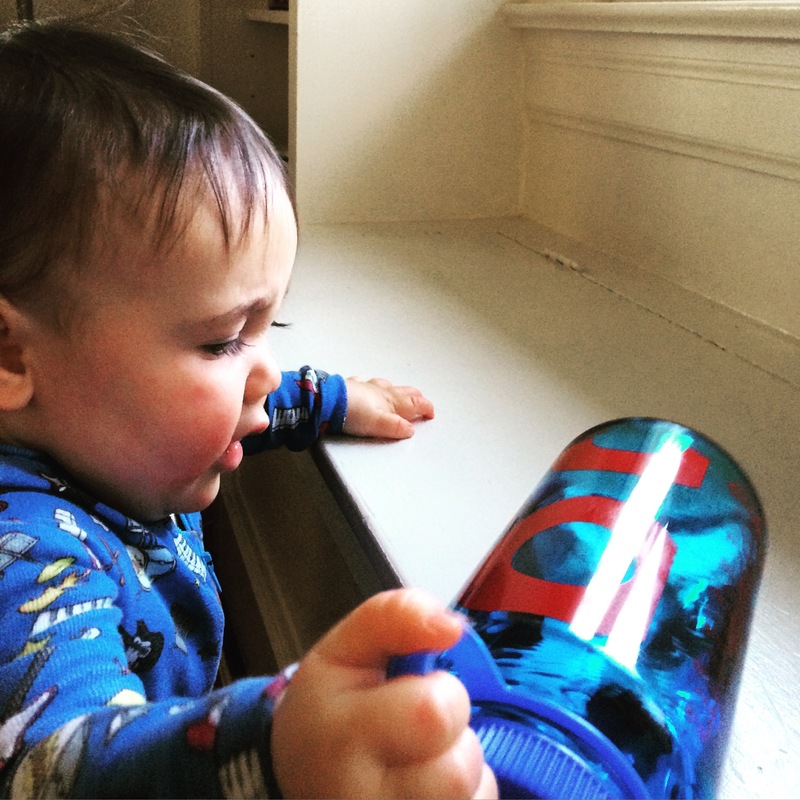 Turns out this awesome Nalgene from Phrames on Etsy beat all the toys as the best entertainment.